Alternative-country with a heartbeat & a voice as pure as the prairie it sprang from. The rootsy sound & lyrics that ring with the kind of hope and heartache found in the best folk songs will make you want to drive down back roads and sing along. It sounds like dirt roads and dust, wind and wheat fields, hope and home. 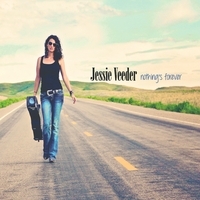 North Dakota Based singer/songwriter Jessie Veeder has been a symbol of folk music in the badlands of Western North Dakota since she released her first original album when she was only sixteen years old. Since then Veeder has gone on to have a successful career in the music industry, traveling the country with a booking agency out of Nashville, recording her second original album A Place to Belong with the Fargo-based label Barking Dog Records in 2005 and then bringing it all home to record Jessie Veeder Live in her hometown in 2007. Today Veeder lives and writes from her family’s 3,000 acre cattle ranch, a place that inspired her latest 13-song anthem to the landscape and people who make up her changing home. It’s the truth in the lyrics and honesty in Jessie’s voice that has grabbed the attention of international media outlets looking to tell Western North Dakota’s story. Jessie’s song “Boomtown,” an homage to the people working to make a living in oil country, has put her in the spotlight as a feature in various news programs, national documentaries as well as programming in Germany and Paris. But beyond the music it’s Jessie’s story that has gained her a global following. Her popular blog “Meanwhile, back at the ranch…” chronicles life on the Veeder Ranch with stories, photos and humor. The success of her blog has landed her a job as a weekly columnist in the Fargo Forum and as a commentator on Prairie Public Radio.